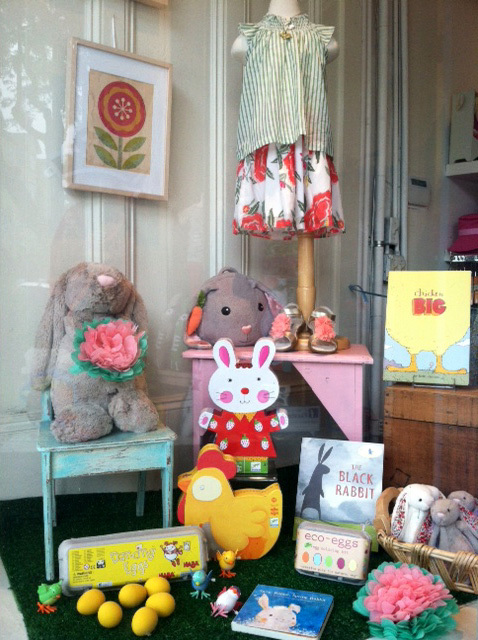 Spring has sprung and Easter is just around the corner. Puzzled about how to fill those bunny baskets? Fiddlesticks has a variety of imaginative and fun goodies to help ring in the spring with a unique and creative flair! Back by popular demand are Eco-Eggs, egg coloring kits made using natural plant, fruit, and vegetable extracts. 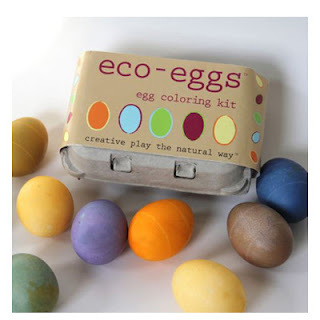 The kits include six dye colors, a dipping wand, a natural wax crayon to cover your eggs with designs, and paper animal accessories your eggs can wear! Storytelling is one of our favorite activities, because it can involve the entire family. Whether the children are the listeners or the storytellers, their imaginations are enriched and stimulated with the imagery storytelling allows them to create. With that in mind, we picked up a collection of springtime puppets from the French line Moulin Roty: Philemon the pig, Albert the lamb, Silvain the bunny, Felicie the chicken, Jeanne and Amedee the ducks. This crew enhance your family storytelling, and fill your baskets with something sweet. Why not replace some of those chocolate eggs with geodes? Geodes are one of the most fascinating of all rock formations: from the outside they look like simple rocks, but when broken open, your child will discover a beautiful crystal world inside. 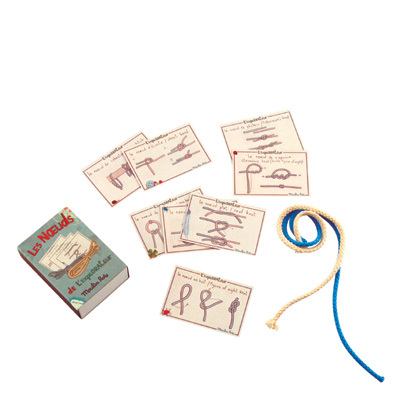 On theme with springtime exploration, we have pocket-sized binoculars and a knot tying kit so they can create their own adventure. Games are a fantastic way to fill those baskets with fun and learning, and so we picked up Dancing Eggs, an energetic, action-oriented game. Players compete to gather the most rubber eggs, but it's not as easy as it seems! A roll of the dice shows players where to keep their gathered eggs (tucked in the crook of an arm, under their chin, between their knees, and so on). When someone drops an egg, the game's over. Great fun for families, this game is eco-friendly and made in Germany. 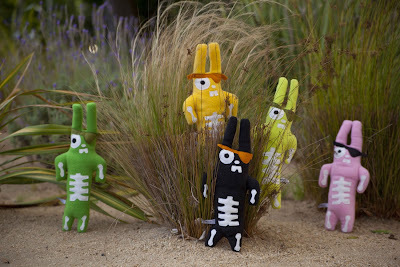 This year we wanted to put a different spin on Easter, and found just the character to do it: Bunnyskelly! Introducing Indy Plush, an L.A.-based handmade plush line committed to making products that use environmentally sustainable, locally-sourced materials. We like to pair Bunnyskelly with the chapter book Attack of the Fluffy Bunnies: perfect for kids with an affinity for pirates and monsters! We have had a tremendous amount of fun these last months finding toys that are creative, special, and exciting. We want children and parents alike to choose their own adventures and explore the world together through imagination, creation, and storytelling. Happy Easter, and Happy Springtime!